The 202,000-square-foot Fremont Mall rests on 21 acres with about 1,300 feet of frontage on the north side of 23rd Street (Highway 30) in northeast Fremont. The site is 700 feet deep with Yager Road the eastern boundary. The west is bounded by a partially vacant strip shopping center slated for future use by the nearby Fremont Area Medical Center. Assisted living centers are in the immediate area, and an active adult neighborhood with a 66 housing units is being developed north of the mall. You can download a PDF copy of the Fremont Mall Charrette Final Report here. The 40-year-old mall cannot compete head-to-head with larger new retail developments in nearby Omaha, but it can thrive as a local community center that focuses on the daily needs of Fremont residents and especially surrounding neighborhoods, businesses and institutions. The site could provide new opportunities for civic engagement and serve as a transportation hub for city or regional destinations. There is significant residential and retail development near the site as well a growing regional health care sector. An auto-oriented design that discourages pedestrian-related activities. Expansive parking areas that contribute to water pollution and flooding due to excessive runoff from impermeable surfaces. Unprotected by trees or shrubs, the site is subject to extremes of heat and cold and visual pollution. Lacking streetscape connection and scale, it does not function as a community gathering place. Without safe and clearly delineated pedestrian/bicycle connections between retail establishments and residential areas, and without a clearly defined community/neighborhood identity and function, the mall is no more accessible to local residents than other malls accessible by auto. The mall lacks appeal as a unique destination and does not meet the expectations of today’s shoppers, who demand a more pedestrian-friendly streetfront experience and access to other forms of transit. Create more access points through new roads, trails, transit centers, and connections and open up the mall on all sides. New residential development to the north suggests an opportunity to open the mall’s blank back wall and create a new road with a pedestrian scale streetscape as well as parkland and a small lake on the current vacant lot. New infill construction along major thoroughfares and new streets/pathways should emphasize walkability and pedestrian scale (i.e. street width should not exceed building height). 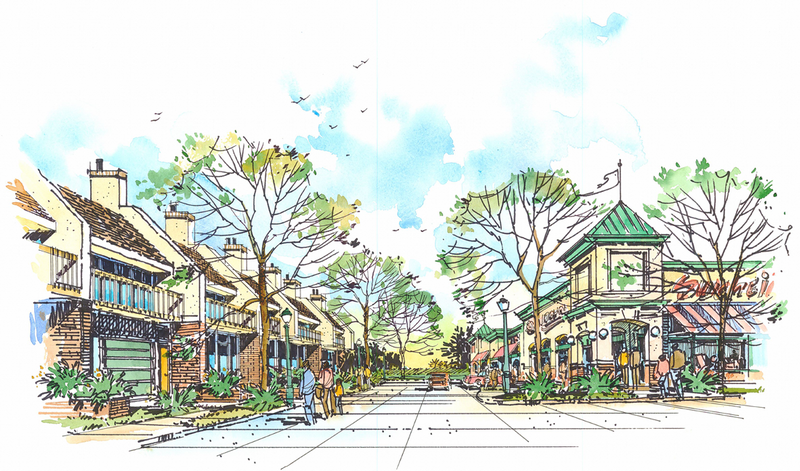 Reinvent 23rd Street as a pedestrian-friendly boulevard from Highway 77 to Highway 275 to create an attractive, continuous, commercial destination. Take advantage of the unique identity of Fremont and its small-town feel. The site could cater to families, connect to the growing senior population in the surrounding neighborhoods, serve nearby health care facilitates, and act as an attractive community plaza/focal point that could include a community center or library to enhance the civic nature of the site. The city should investigate the development of an innovative transit system by combining aspects of demand-responsive and service route systems. The mall could serve as a transportation hub for commuter transit within the city as well as to Omaha and other regional communities. A transit system could be part of marketing strategy, using vehicles with a low scale, user-friendly appearance. Permeable surface parking lots, solar and wind energy installations, and green roofs would provide long-term cost savings as well as unique, eco-friendly marketing opportunities. Generous plantings of low-water perennials in parking areas and even rooftops would reduce runoff and “heat island” effects and would also help delineate pedestrian pathways. Mix tried and-true retailers with more distinctive and unique local retailers to appeal a broader and more diverse market. Consider how the mall can target “empty nester” residential and the growing network of health care services located near the mall. The area’s strong agricultural roots also suggest a location for a farmer’s market. The City of Fremont and area development interests (i.e. mall owners and other retail, health care providers, housing contractors) must work together to create an integrated plan for the mall area that considers how the site can best serve the local population while competing in a regional economic market. It must become a local political priority (city and county) to provide incentives for new investment and owner/developer coordination. It is critical to build consensus with all current and potential stakeholders.